Discussion in 'Pearl Harbor' started by OpanaPointer, Sep 28, 2015. Anybody have a source with hard numbers for reinforcements sent to Hawaii after the IJN raid on Pearl Harbor? I see proposals for an invasion by Japan and they always use the pre-war numbers, something I doubt would be close to reality. Chapter VIII in GUARDING THE UNITED STATES AND ITS OUTPOSTS by Stetson Conn, Rose C. Engelman, and Byron Fairchild? Are the dynamic duo working on another IJN Conquers the World with Imperial Ninja SNLF fantasy? Thanks, I haven't looked at that one in a looong time. Current issues involve answering questions sent to me from a graduate class at Tokyo U. Framework for Hemisphere Defense, Chapter VII, The Reaction to Pearl Harbor also has a bit on the reinforcements. Otherwise, Chapter 18 in Glen Williford's, Racing the Sunrise: The Reinforcement of America's Pacific Outposts, 1941-1942 is probably the most complete secondary source. Excellent. I think they can find book books at the Uni library. Even with out reinforcements the total man power on the islands would have required the Japanese to abandon any thought of taking the DEI, Malaysia, the Philipines and Burma. The shipping requirements for such a force were beyond what Japan could gather and have any left over for any thing else. Since the carriers were not hit and the Japanese carriers could not stick around any attempt would have been hurt badly even if a landing was successful. Edit: Some of the light, old guns(3"/4.72") had been removed by 1941. That's "just" the fixed batteries. The mobile one were nothing to sneer at. Last but not least, some concerete pillboxes, many additional fire control stations, two underground command centers and an underground ammunition depot were constructed during the 1930s. Hmmmm, that doesn't mention any USN 16" mounted in 1942. Because no such thing happened. The two existing 16" batteries had concrete bunkers built over their guns. Two of USS Arizona's 14" turrets became shore batteries but only one got operational and only in 1945. Other than that the biggest guns added after Dec.7th were 8" guns, including Saratoga's I think. By the way, shore batteries were part of the Army, not Navy. Yeah, I meant 14". Couldn't remember when Arizona Battery went into service. But the list goes to 1950, right? Or did I miss something? The other page I did not photograph has the batteries added after the war had broken out. 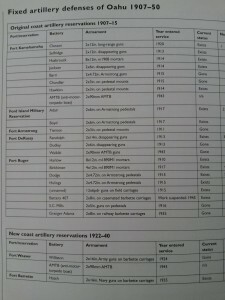 While the list goes to 1950, most of the older batteries were deactivated and their guns scrapped soon after the war ended, the newer ones folled between 1948 and 1950 when the Coast Artillery Corps was abolished. Only a few AA-batteries survived some more years before they were replaced by AA-missiles.